The Seine River cuts through the heart of Paris, comprising the city’s historic channel for commercial trade. 37 bridges cross the Seine River within the city limits of Paris. Bridges such as the Pont des Arts, the famous Lock Bridge in Paris, complement the views of the river and the city at night. Aside from adding to the visual splendor of the City of Lights, the many bridges of Paris served a historically utilitarian purpose in protecting the city. No visit to Paris is complete without taking a stroll along one of its many bridges. Here is a list of some of our favorite bridges in Paris. At The Paris Guy, we want your experience in the City of Lights to be nothing short of magical. We love Paris, and we want our love for Paris to show in your experience with us. That’s why we offer a range of Paris tours designed to make the most of your visit to Paris. Experience the Seine River and some of its many bridges for yourself with our Eiffel Tower evening tour featuring a sunset cruise along the Seine River. Make the most of your visit to the City of Lights with The Paris Guy. The city of Paris did not always have bridges crossing the Seine River. It wasn’t until 864 A.D. that the passing of the Edict of Pistres mandated the building of bridges across the Seine River in response to the sack of Paris by Vikings in 845 A.D. This strategy proved effective during the Siege of Paris in 885 A.D. as Viking ships were unable to pass beyond the bridges crossing the Seine. There are now thirty-seven bridges crossing the Seine River within the city limits of Paris. Of these 37, only five are pedestrian bridges. Here are some of the most iconic bridges in Paris. The Pont des Arts connects the Institut de France with The Louvre. The bridge was originally constructed in 1804 during the reign of Napoleon. The original Pont des Arts suffered two aerial bombardments during World War I and II, as well as numerous collisions with boats before collapsing in 1979 after a ship rammed into it. The present-day bridge was built in 1984 and is now a UNESCO World Heritage Site along with the rest of the Seine Riverfront in Paris. The Pont des Arts is a popular spot for picnics and open-air art studios. The bridge’s position along the Seine River and The Louvre makes it a popular spot for photographers as well. The Pont des Arts is most famous for being the Lock Bridge in Paris. 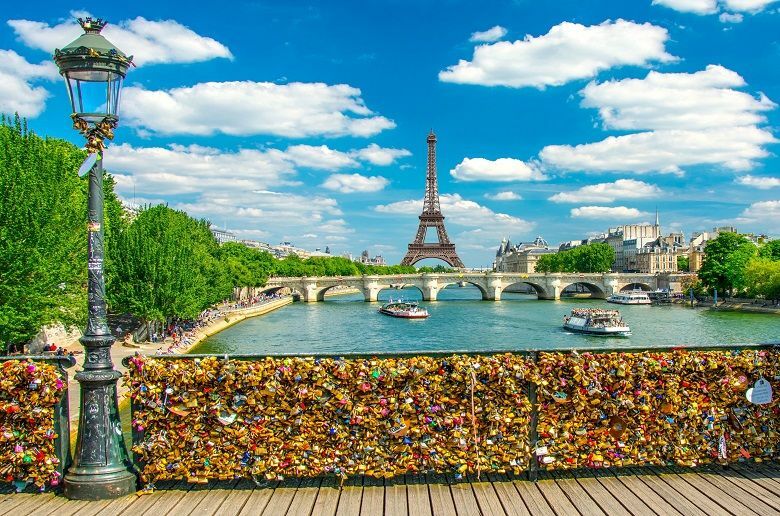 Visitors to the bridge attach personalized padlocks to its railing and throw the keys away in the Seine River. Despite the government of Paris removing many of the locks in 2015, over a million more (approximately 45 tons) have been placed on the bridge since then. The Passerelle Simone-de-Beauvoir is named for French philosopher and activist Simone de Beauvoir and is the most recently-built bridge in Paris. Completed in 2006, the Passerelle Simone-de-Beauvoir is used solely by bicyclists and pedestrians and leads to the Bibliothèque Nationale de France, the French national library. The modern design of this footbridge boasts a lens-shaped structure that does not touch the water at any section of the bridge. Its supports rest on the banks of the Seine River at each side. The Pont Alexandre III is Paris’ famous Beaux-Arts style bridge. Named after Tsar Alexander III and built in 1900, the Pont Alexandre III boasts iconic sculptures depicting fames and nymphs from Greek and Roman mythology. The bridge debuted at the Exposition Universelle in 1900 along with the Grand Palais and Petit Palais. The Pont Alexandre III is built in alignment with Les Invalides and connects its buildings and the Eiffel Tower with the Champs-Élysées. The bridge’s exuberant design is featured in cameo appearances in movies such as Ronin, Midnight in Paris and Anastasia. The Pont Neuf is Paris’ oldest existing bridge across the Seine River. The bridge is located on the westernmost point of the Île de la Cité, one of Paris’ two natural islands in the Seine River. Henry IV completed construction of this “new bridge” and inaugurated the structure in 1607. Visitors to the Pont Neuf will enjoy its many sculptures including the mascarons, stone masks that line the side of the bridge, and the bronze statue of Henry IV on horseback located at the crossing of the Île de la Cité. Formerly the Pont de Passy, the Pont de Bir-Hakeim is named for the World War II Battle of Bir-Hakeim which involved French and German forces in Africa in 1942. This dual-level bridge hosts one level for pedestrians and motor vehicles and another level with a railway viaduct. This steel bridge passes through the artificial island of Île aux Cygnes, where visitors will see a replica of the Statue of Liberty. The Pont de Bir-Hakeim makes cameo appearances in blockbuster movies such as Inception and National Treasure: Book of Secrets. With 37 bridges crossing the Seine River in Paris, visitors to the city will enjoy the fresh perspective the river brings to the scenery of Paris. One of the best ways to experience the many bridges of Paris is from the Seine River itself. Admire the city’s many bridges on a Seine River cruise. Experience the nighttime view of the City of Lights with our evening Eiffel Tower tour featuring a sunset cruise of the Seine River and complimentary champagne toast. Make the most of your Paris experience on one of many Paris tours with The Paris Guy.